Learning2 is an innovative, engaging and constantly evolving face-to-face conference with a focus on leveraging technology to support learning globally. Since it’s inception in 2007, Learning2 is considered to be one of the leading annual educational technology conferences in the Asia region and is now expanding into new regions including Africa, Europe and South America. In 2015, Learning2 become a not-for-profit organization with the mission to innovate social learning globally. Like many conferences, Learning2 started simply as a conversation between passionate educators from international schools in Shanghai initiated by Michael Weber (Director of Technology at Concordia International school) and John Zurfluh (Director of Technology at Shanghai Community International School). As the conversations started around what this conference would be about, features started to emerge that still hold true today. First and foremost we wanted the conference to be different. We wanted the conference to emulate as closely as possible what we want teachers to do with technology in learning spaces. Why is it we say we want student-centered classrooms yet conferences themselves are not “student-centered”? So we set off to create a conference that would “be different”. With backing from ACAMIS (Association of China and Mongolia International Schools) and EARCOS (East Asia Regional Council of Schools), the first Learning2 conference was held at Concordia International School in September 2007. It was a great year to start a technology and learning conference. Web 2.0, or the idea of the participator web, was gaining traction. If our conference was going to be different it had to put social interactions between participants as a top priority. Facebook was skyrocketing in popularity and Twitter was a little known network with less than a million people using it. We knew that if we wanted educators to take risks in using technology in innovative ways in their classroom that we, as a conference, needed to show show that learning is about risk taking. In the first conference in 2007 and again in 2008, we made everyone sign up for a Twitter account. At the time the majority of the participants didn’t know what Twitter was, how to use it and none of us knew what it would become. Jeff still has people come up to him today and tell him they started their Twitter account at that first conference. That was risk that worked. We used the conference as a way to experiment to see what worked and what didn’t within a learning environment, such as the use of Moodle and the social network Ning as our conference websites. To this day ‘social’ is a fundamental aspect of how the the conference schedule is structured. In 2010, we broke from the traditional workshop format and took another risk where all but about three hours of the 2.5 day conference were done in an ‘unconference’ format. Virtually every conference session that year was created on the fly from the participants. The conference once again was social, perhaps a little too risky, as we challenged our participants to personalise their learning, making the shift towards a learner-centred, participant-driven conference. The following year, 2011, we tweaked the format again. We added job-alike, topic-based cohorts led by teachers who had been nominated by their peers as leading teachers. We had cohorts of technology coaches and administrators, librarians, science, humanities, Chinese language, Early Years as well as digital storytelling, assessment for learning and other broader topics. This time, the feedback from the participants clearly showed that the sessions facilitated by our educators in the region were the most valued. Teachers were able to go straight back into their schools with many practical, new ideas as well as to continue to share their ideas in their newly formed professional learning network. In 2012, the vision for the conference to be hosted outside of Shanghai was finally realised with Western Academy Beijing (WAB) hosting the conference in Beijing. Organisers also took on the challenge to put structures in place to be able to continue moving the conference around the Asia region. We started to bring committee members onboard from within and outside of the region by having regular online meetings and using the cloud as a space to collaborate. As is often the case with international teachers, experiencing new cultures is high on the list of priorities. Our Learning2 community is transient with many of our strong supporters moving out of the Asia region into Europe, the Middle East and Africa. Not surprisingly we have found overwhelming support for the conferences to be held in these regions. In 2013, Jim Laney, Head of School at ICS Addis Ababa, Ethiopia, approached Jeff and asked about bringing the Learning2 conference to international educators in Africa. In 2014 the first Learning2 in Africa conference was held at ICS Addis Ababa, setting in motion the expansion of the Learning2 conference globally. In 2015 Learning2 became a fully registered 501c in the US. We are proud to continue the core strength of our conferences being run by teachers for teachers in collaboration with our hosting schools around the globe. So what does Learning2 look like today? In early 2015 Learning2 became a global non-profit organization with a mission to “innovate social learning globally”. Learning2 is overseen by advisors, a core of four educators that include Simon and Jeff, who have been involved since that first meeting back in 2007, and Kim and Madeleine, both of whom have had significant organisational roles in recent years. create a conference that is ever changing, takes risks, and uses technologies appropriately in the learning process. With our Asian-based conference hosting over 300 participants, our Learning2 community continues to expand each year. With many participants returning year after year, it is important that we continue to bring in new ideas and continue to take risks. Our format has evolved and with it the language of the conference. In our current model, we have Learning2Leaders, between 8 – 16 depending on the size of the conference, who run Extended Sessions, typically 3 hours. They also present Learning2Talks at our plenary sessions. These talks are short, less than 5 minutes, and tell a compelling story, often from the heart. We have cohort facilitators to lead our daily job-alike networking sessions and the ‘unconference’ sessions which are participant led and promote spontaneous just-in-time learning through facilitated conversations. How do we organise Learning2? The organisation of each Learning2 conference has led to better understanding of how to use technology for global collaboration and learning. In 2012 when the conference moved from Shanghai to Beijing, we had to rethink the face-to-face organisation and move to online collaboration and communication tools so as to accommodate different timezones and locations of our expanding committee of volunteers. With the support and online learning expertise of Julie Lindsay, also a member of the 2012 committee, we used Elluminate (now called Blackboard Collaborate) to meet virtually. For many of the team this was an entirely new experience and we developed protocols for both communication during meetings and for organisation of essential shared online documentation. Moving forward to 2015, we use Google Hangouts (GHO) for online meetings and have a well-structured Google Drive to house all documentation and asynchronous communication. At times, when the Great FireWall of China challenges us as does the limited bandwidth in Africa, we hop over to Skype, either text or voice, and sometimes resort to quick-fire email. Meetings will always be challenging especially as we move towards having conferences across four or more continents as these might take place in the small hours or late evenings for some and bang-smack in the middle of the school day for others. What is the Future of Learning2? The vision is to have Learning2 conferences hosted around the world. Since 2014 we have successfully hosted additional conferences in Africa and Europe in our mission to ‘innovate social learning globally’. The continued globalisation of Learning2 will be, by far, our biggest challenge, as we continually evolve the global Learning2 ‘brand’ and meet the needs of our participants locally. We continuously re-developing our structures to sustain and support the growth. We have expanded our organisational team by reaching out to the ever-increasing Learning2 community to include coordinators for global branding, marketing, presenters, pre-conferences and workshops. The organisation is almost entirely online and we have become extremely efficient and effective at collaborating in that mode. Keeping the conference fresh means that we are constantly seeking new faces for our Learning2Leaders (L2L), who in turn need to be ‘upskilled’ in all things Learning2. We have introduced an online training course for new Learning2Leaders & PreConference Presenters, who really are the ‘face’ of each conference. We have set up our L2L alumni community, a resource of highly-skilled, connected global educators, who we tap into to mentor our new L2L, be our sounding boards, offer new ideas. As many of our alumni will attest, becoming a L2L has opened many doors, from connecting classrooms across the globe to leadership opportunities in their schools and beyond. Global-mindedness is an underlying, although unstated feature, of the Learning2 culture as the vast majority of educators attending Learning2 conferences are drawn from international schools with diverse student populations. By moving Learning2 each year to different countries, our participants continue to explore new cultures and to gain a deeper understanding of the diverse learning environments. At the same time, teachers draw upon and share their personal experiences to bring meaning to the learning. At each conference, we invite a number of presenters from different regions, to bring in other perspectives. As a result, the discussions are globally diverse and culturally rich. By providing ample social and networking opportunities, the participants develop relationships which continue to grow long after the event. Many participants experience an increase in Twitter followers and widening Google circles as the #learning2 hashtag continues to connect the Learning2 community within and across continents. Since 2007, the Asia region has experienced a significant shift towards a student-centered, collaborative learning environments. With the hundreds of educators that have participated in Learning2 over the years, we wonder what impact the Learning2 conference has played in developing global educators to lead this change? We also ponder what impact Learning2 will have in the future in leading the change as it races to fulfil its mission to ‘innovate social learning globally’? Hett, E. J. (1993). The development of an instrument to measure global-mindedness. (Doctoral dissertation, University of San Diego). 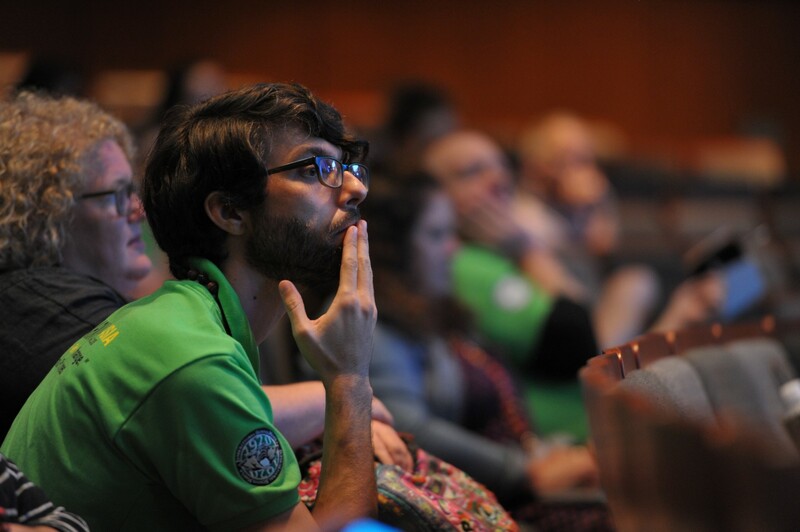 Create a conference experience that is new, fresh, and pushing the ideas of what a conference should be.